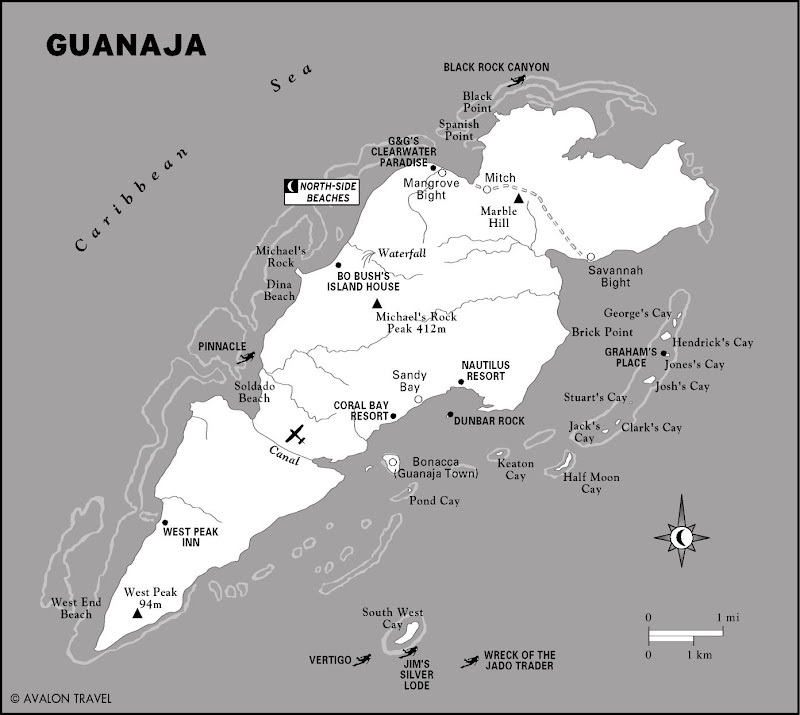 The island Guanaja is interesting to me for so many reasons. The residents (citizens of Honduras…though some deny it) speak English and Spanish. The large main island is sparsely populated while everyone huddles on the tiny, tiny cay. The Cay has no roads or cars. The residents have a very close tie with the Cayman Islands (The Cay was founded by people from the Caymans). Almost everyone has family there and people travel back and forth. Jimmy Carter fishes there. There is talk that the US is building a base there. It is amazingly gorgeous and relatively unvisited. What is not interesting?So I described how I got to Guanaja and where I was staying in yesterday’s post: Guanaja Part One. We were staying at Bo’s Island House on the west side of the island, our host, George, had a cool boat and it was time to explore. Bo’s has a great beach but like most of the beaches on the main island, there is hardly anyone else there.We had a few beers, hopped onto the boat and headed through the canal to the east side and the little cay where most of the residents of Guanaja live.The main island is practically untouched. We headed through the canal to the other side and passed the TINY airport. This air strip makes the one on Ambergris Caye look like O’Hare. Here is a map to help you get oriented. Bo’s is on the North-Side and The Cay or Guanaja Town on the South. And pulled up to the Cay…a tiny island jam packed with houses on stilts, sidewalks, businesses and lots and lots of fishing boats. The Cay as you arrive. We parked at a dock that was locked for the day. Luckily, we found three eager assistants to run and get the dock owner. Thanks Mario, Dilberto and friend. We headed to a local bar “The Office” (doesn’t every town have a bar by that name?) to pick up George’s body guards. I kid you not. His body guards. Look at the decor. I felt like I was in a frat house…love the cds hanging from the ceiling and the posters of Lil Kim and Nelly. Here is Danni enjoying a cold Barena. We were at this bar more than once during our two day trip to Guanaja. Body guards in tow, we headed out to a slightly more upscale bar back on the main island. Managed by a very friendly German couple, Claus and Annette, this bar is one you should definitely stop at when in Guanaja. Manati Bar and Restaurant. They have a pool table with a very cute lamp, a very German theme and a few German wheat beers on the menu. Emily…such a gracious winner at pool. Here is the entire crew at Manati’s…minus our host George and well…me. From left to right: My travel mates Cesar, Emily, Dani and Guanaja residents Leslie/Lester, Ted and Aaron. We had met the owner of a small cay the day before at the Green Flash Bar and he invited us for a visit. Steve is an avid fly fisherman and runs the resort at Jones Cay called Fly Fish Guanaja. It’s kinda fun to meet new friends that own islands. Just a tiny bit of sand right on the reef. The view of the reef from the island. From left: Steve, his friend Emily visiting from Hawaii, Emily from CA, Cesar and Danni. Good times but on to the next island! Across the water (you can see it behind everyone in the above picture) is Graham’s Place on Graham’s Cay. The first thing you see when you get on the dock are the huge pens with large turtles, sharks and fish of all kinds. And quite a few parrots and birds in cages. Until you see the VERY strange selection of dolls and knick knacks around the bar. Seriously creepy. Time to head back to Bo’s. Navigating these shallow, coral filled waters after dark is a very bad idea. We returned to The Cay where George had some business to do. As George had said earlier that day “I’m an f-ing pirate and you are just a bunch of nerds”. The bodyguard-less nerds were tired and took a water taxi home. Pirate George waited until after dark to return back to the island house and learned the hard way about night navigating…he hit a coral head. But this post is getting too long already…more about my trip to the Bay Islands later. Have a great Mothers’ Day everyone. One negative about the island for me: there is some serious sand fly action. I got mauled. So…when you visit this place (and you all MUST), make sure to research a repellent that will keep these nasty, nasty spawn of the devil from eating you. wow…. looks even tinier than caye caulker! why doesn’t anyone live on the main island? Great post, and lovely read. Question for you. Why is there a need for the guy to have body guards in such a remote location? Love the straw hat lamp shades over the pool table! Such a quirky place – you’ve convinced me I must visit one day. Sharon, you MUST visit this place some day. It’s almost frozen in time…VERY COOL SPOT.